How many types of pit bulls are there? What do people mean when they talk about different breeds, different bloodlines, red nose pit bulls, blue nose pit bulls or blue pitbulls? The term pit bull at one time referred exclusively to the American Pit Bull Terrier. Now it's common usage has been broadened to include the American Staffordshire Terrier and the Staffordshire Bull Terrier. And, you might well ask why since the two latter ones do not have "pit bull" in their names. The story goes like this. After flatly refusing for a number of years to reigster the American Pit Bull Terrier, the American Kennel Club finally relented in the mid 1930's. But, they didn't like the name 'pit bull' because of its association with dogfighting. So they changed it first to Staffordshire Terrier and later to American Staffordshire Terrier. The dog the AKC chose to represent the standard for the American Staffordshire Terrier was a well known American Pit Bull Terrier, Colby's Primo. Among breeders of that era, it seems that some had a preference for smaller, stockier types of pit bulls while other breeders favored the larger, slightly leggier appearance of dogs like Primo. Initially, the AKC divided the breed into weight classes. 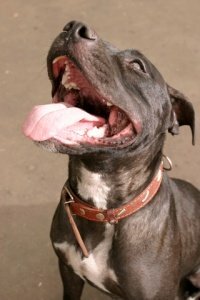 Ultimately, they categorized the smaller dogs as a breed of their own--the Staffordshire Bull Terrier. So, I think you can see why many people feel these three breeds are really the same. Some people take the position that the American Staffordshire Terrier is the show dog version while the American Pit Bull Terrier is the working dog version of essentially the same dog breed. Still others will say that after 75 years of divergent breeding programs, they should now be considered separate breeds. Follow this link to read more about these three types of pit bulls. Even if your interest in pit bulls is relatively recent, you've no doubt heard people speak of red nose pit bulls and blue nose pit bulls. And, from the way people carry on about them, you might think they are different or somehow superior to other types of pit bulls. The truth is the only thing that is different or special about the red nose or blue nose pits that people talk about today is the color of the dog's nose leather. There was a strain of red nose pit bulls brought over from Ireland in the mid 1800's that became referred to as the Old Family Red Nose. These were fighting dogs bred for gameness. The red nose color was a side-effect, not the goal of the breeding program. Nevertheless, because the OFRN gained quite a reputation in dogfighting circles, it seems a certain fascination developed around pit bulls with red noses. But, what of blue nose pit bulls? That's a little harder to figure. But, I would speculate that around the time blue pit bulls became all the rage, some enterprising breeders decided to piggyback on the red nose mystique by promoting the blue nose pit bull. An unfortunate aspect of all this is that when a breeder limits himself to a small gene pool to insure the production of pups of a certain color, he may be sacrificing health and sound temperament in the process. First, I want to acknowledge that my view of breeders and breeding programs is a bit jaded. On the one hand, the most established and meticulously selective breeding programs seem to have their roots in the blood sport of dogfighting. Some names that come to mind in this vein are Colby, Sorrells, Heinzl and Boudreaux. Most breeders who are carrying forward these bloodlines today state prominently on their websites that they are not involved in the illegal activity of dogfighting. But, rather they are carrying on the heritage of a working dog that was bred for its physical strength, courage, determination and affection for humans. Indeed some of these breeders are actively working to re-channel the breed's legendary gameness into legitimate activites like search and rescue and drug and bomb detection. On the other hand, many of the bloodlines that have emerged during the late part of the twentieth century seem to focus more on achieving a certain appearance than on soundness of temperament or physical health. 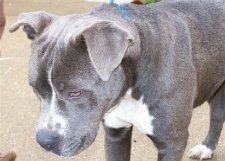 In my view, these programs are a detriment to the breed and are responsible for the pain and suffering of millions pit bulls--many of them now homeless because such breeders will rarely take back a dog that turns out to be physically sick or mentally unstable. If you are considering bringing a pit bull into your family and you are wondering about bloodlines, here's my advice. Unless you need a working dog that was bred to excel at a particular function, you are better off adopting a temperament tested pit bull from a rescue or shelter. True working dogs are rarely happy merely being a family pet. Their energy level and drive dictate that they need a J-O-B as well as being part of a family to be at their best. If you are wanting a pet but get a working dog instead, you'll pay more than you need to and you may end up with more dog than you bargained for.